I have a nine week old schnauzer. I purchased her, because she was much smaller, than the others, left in her litter. According to the breeder, there was one other as small as her. She does not weigh more than one pound, probably not even. Her sister was three times her size. Is there any way, to estimate her size for adulthood? Comments for My schnauzer puppy is so small. That cute teeny-weeny little mini-Schnauzer named Bubbles, born January of 2011, who weight in at barely 1 lb. at age 3 months, grew up very nicely, I am happy to report. She is one lively dynamite pack today who rules the house, her mom, as well as her over-sized buddy Mr. Barney, also a Schnauzer, who certainly grew into far more than a mini-schnauzer [got to know your breeder]. Bubbles looks like a true-to-life Mini-Schnauzer who is just a "smidgen" below AKC standards. Who cares? This one is rated on the "cutest" scale where she would rank a "10". First step with a "runt" is to check for health issues. Off we went to see a qualified small-breed Vet for parasite testing. Sure enough, she tested positive. Cost for the doctor and treatment, plus her 12 week follow up shots $85. Money well worth spent to save a puppy, if you ask me. After a few more weeks Ms.Bubbles began to fill in. At age 7 months she even grew some heights in her legs. Today [1/23/12] Bubbles has achieved a height of 10.5" at the shoulder and weighs in at 5.5 lbs. and she is a real "talker". As a former breeder I always worry when there is one pup much smaller than the rest. I know that in 2 litters I had there was one pup in each that was very small compared to the rest of the litter. It turned out that both had slight heart murmurs that were causing them to grow much slower. They did grow out of it and soon caught up however you should be sure to have this pup checked by your vet. 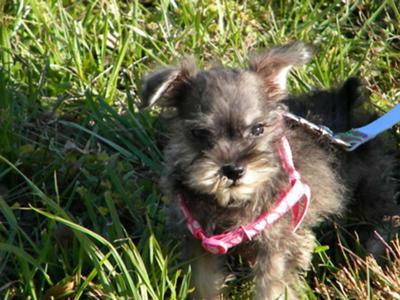 a mini schnauzer girl born 1/19/11 and her weight is at most 1 lb or even less. The picture I received were deceiving, and I have no idea if tiny Ms. Bubbles will ever make it to at least 7 lbs. but I hope so. She has absolutely no fear and plays with my 25 lb. male schnauzer as if she was his equal. Her refuge is the under site of my bed where he can't follow. He senses her vulnerability and seems to play very easy with her but I still have to give her a break from him now and then due to the size difference. Good luck with your puppy and I pray both will grow some height soon.